In this post I continue to write up the Pathfinder iconic characters for use in the Dungeon Fantasy Roleplaying Game. Links to all of them will appear in the project page, which also contains links to the GURPS Dungeon Fantasy versions. I’m kinda torn on Valeros, to be honest. His character design and bio are the blandest among all the Iconics I’ve seen, but his adaptation is very interesting mechanically. This is because the Knight template is the complete opposite of the d20 Fighter. It really is as good at fighting as advertised, which means its as valuable to the party as any wizard or cleric. Valeros is from the nation of Andoran, his world’s “18th century US” equivalent. He’s the typical farmboy who ran away from home and towards adventure. He wears medium armor and fights with paired swords. He likes making lots of attacks on vulnerable enemy locations. He has a bow as a backup for ranged combat. There’s not much more to him. In the GURPS version we’ll give him paired broadswords because unlike d20 there’s no restriction on using them here. The Knight template didn’t change much between GURPS DF and the DFRPG, but there is one thing preventing me from just copying the original stats here: the DFRPG lacks the Dual-Weapon Attack technique, not even in the form of a simplified powerup. So here I replaced it with Ambidexterity and Sacrificial Parry, making him a bit worse at attacking multiple times per action but better at protecting his buddies. 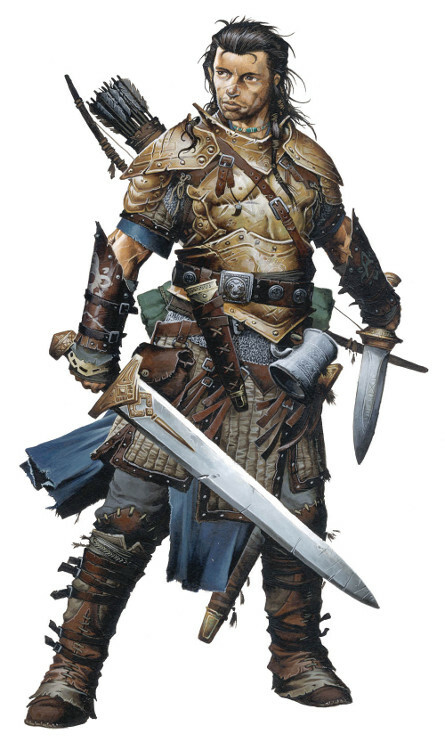 If you have access to GURPS Dungeon Fantasy 11: Power-Ups, simply switch those two traits for the Two-Weapon Fighting (Broadsword) advantage, which would allow him to attack twice in a turn without penalties. His skills in this version are also slightly different, and once again the gear list uses the new armor table. Damage 1d+1/2d+2; BL 25,6kg; HP 16; Will 10; Per 10; FP 13; Basic Speed 6.75; Basic Move 6. Ordinary Clothing [Torso, Limbs]: Free, 1kg. Heavy Leather Armor Suit [Torso, Limbs, Head]: DR 2. $450, 18kg. Shoulder Quiver [Torso]: Holds 12 arrows. $10, 0.25kg. Arrows x12 [Quiver]: $24, 0.6kg. Regular Bow [Torso]: Damage 1d+2 imp; Range 240/320; $100, 1kg. Large Knife [Torso]: Damage 2d cut, Reach C-1; or 1d+1 imp, Reach C; $40, 0.5kg. 2 x Broadsword [Torso]: Damage 2d+7 cut or 1d+6 imp; Reach 1. $1200, 3kg. Backpack, Small [Torso]: Holds 20kg of gear. $60, 1.5kg. First Aid Kit [Backpack]: +1 to First Aid. $50, 1kg. Rations x4 [Backpack]: $4, 1kg. Personal Basics [Backpack]: $5, 0.5kg. Waterskin [Backpack]: Holds 4L of liquid (4kg if water). $10, 0.13kg. Tankard [Backpack]: Holds 0.5L of liquid. $5, 0.25kg. Rope, 3/8” [Backpack]: Length: 10m. Supports 150kg. $5, 0.75kg.